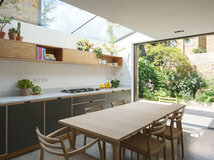 Houzz UK contributor and award-winning landscape and garden designer. 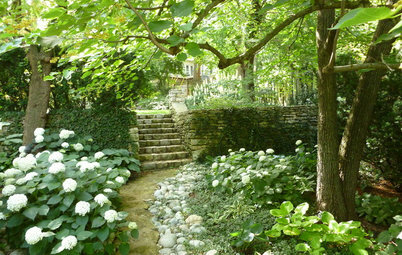 Claudia de Yong Designs offers a consultancy and design service for the private and corporate client. 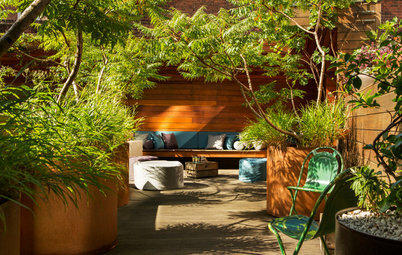 We are also able to source anything for the garden from plants to pots, paving and architectural features . 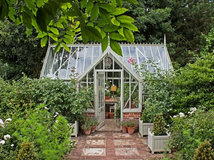 Please visit my new online shop for garden products. Despite the shortening days, the month of October can bring a richness of colour to the garden thanks to the many late-flowering bulbs, perennials, grasses and foliage. Added to this are the fruits and berries on many shrubs, including cotoneaster and crab apples, which provide much needed food for the birds. Below is just a small selection among many favourites. Sedums are a staple for the late summer and autumn garden, providing much needed colour and nectar for bees, butterflies and hoverflies. In late May, if you carry out the ‘Chelsea chop’, you can prevent sedums from looking floppy later in the season. Hylotelephium telephium ‘Purple Emperor’, pictured, is part of the atropurpureum group and has lovely deep-plum/black-bronze succulent leaves that carry red to purple floret flowers on branching heads. 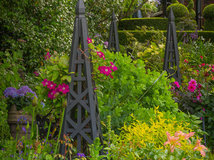 The flowers can be left on all winter long to add structure to a border. 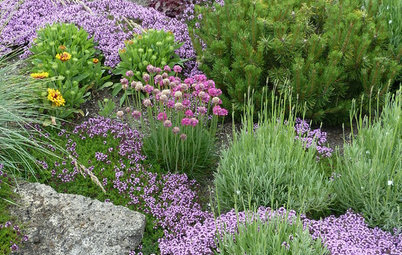 As sedums have fleshy leaves that store water, they cope well in dry conditions. This variety also does well in wetter, cooler conditions if planted in an open, sunny and airy position. 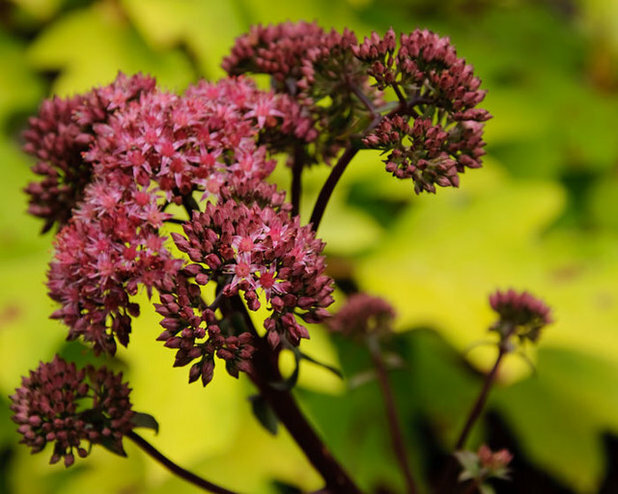 Sedum ‘Autumn Joy’ has flatter pink flowerheads and sturdier stems. It flowers well into November and looks great with ornamental grasses. 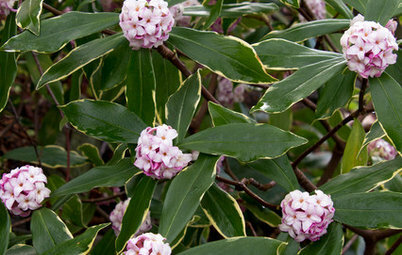 What’s the perfect evergreen shrub for your garden? There are few plants that continue to flower right through the late summer into autumn like the Japanese anemone. It can be known to colonise areas, so plant it where it won’t compete with other plants. The tall and elegant white hybrid ‘Honorine Jobert’, pictured, has lovely neat white flowers with a bright yellow stamen around a green-coloured centre that’s neat like a pin. ‘Honorine Jobert’ does well in a shady corner of the garden, as well as against a north- or east-facing wall. ‘Hadspen Abundance’ is a lovely variety which is unusual as it has a two-tone effect producing two small dark pink petals surrounded by three larger paler pink petals and has lovely dark foliage. Anemone ‘Max Vogel’ has single, light-pink flowers that fade with time. It looks good in a woodland garden and the leaves are great for ground cover, but it can become invasive if not kept in check. There are some lovely semi- and double- to double-petalled varieties and Anemone x hybrida ‘Konigin Charlotte’ is a semi-double with masses of large rich rose-pink flowers, with 10-15 overlapping petals on long stems with lovely semi-evergreen vine-shaped leaves. For a deeper shade of pink, choose the semi-double Anemone hupehensis var. japonica ‘Bressingham Glow’. If you like blue or purple, Asters (or Michaelmas daisies) are invaluable for the late summer and autumn garden, as well as being wonderful pollinators. Aster ‘Little Carlow’, seen here, produces a mass of tiny blue daisy flowers with bright-yellow centres above a mound of small green leaves. A sunny, well-drained spot with good air circulation is the best place to plant this lovely clump-forming hardy perennial. Aster x frikartii ‘Monch’ has slender lavender-blue daisy flowers and vigorous growth above sturdy stems. It is highly prized for being disease resistant. 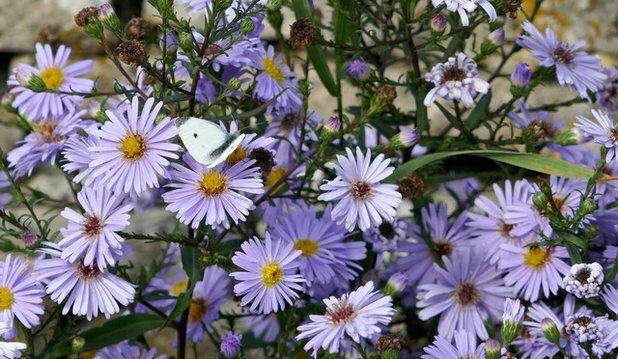 Aster ‘Violet Queen’ can reach almost 40cm high, has vibrant purple flowers and is a real butterfly magnet. It also looks wonderful planted with Pennisetum orientale (fountain grass). There are a some wonderful bulbs that flower in autumn and add a bright splash of colour to the garden. 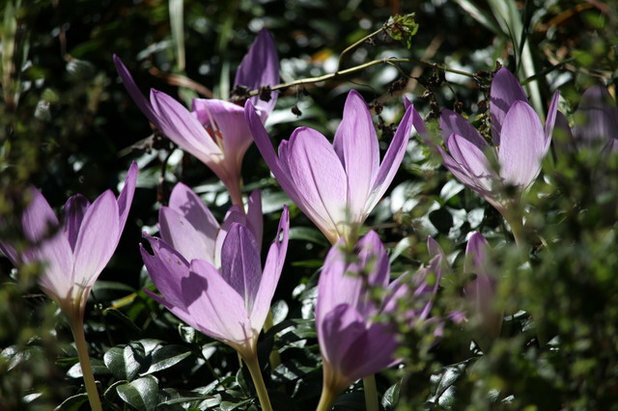 Colchium cilicicum or autumn crocuses (also amusingly called naked ladies) are low-growing, upright cormous perennials. The funnel-shaped purple flowers, shown here, appear before the leaves and they’re ideal under deciduous trees and shrubs or naturalised in grass. Plant the corms about 10cm deep in the late summer or early autumn and, if planted in the lawned areas, leave the foliage to die down before mowing. Also be aware that parts of the plant are poisonous if ingested by humans and pets. Another wonderful moderately vigorous perennial bulb worth considering is Nerine bowdenii. The funnel-shaped and mildly scented flowers look like bright-pink fireworks on long stems; these appear before the leaves. 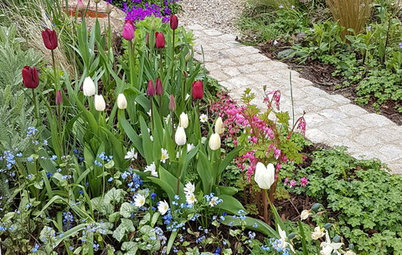 Plant the bulbs in a warm sheltered and sunny position, against a wall is best, in sharply drained soil (in other words, with a lot of grit in it to help with drainage). They’re best planted in the summer months, with the tip of the bulb just showing above the soil level. And don’t forget Cyclamen hederifolium, which will self-seed and flourish in shady areas, as well as being a great choice of bulb to use for underplanting other plants growing in pots. Actaeas belong to the buttercup family, which are all ranunculaceae (comprising around 2,252 species including plants such as anenome, pulsatilla and hepatica). Among the atropurpurea group of actaeas (meaning the purple varieties) is Cimicifuga simplex ‘Brunette’, which you can see in this photo. 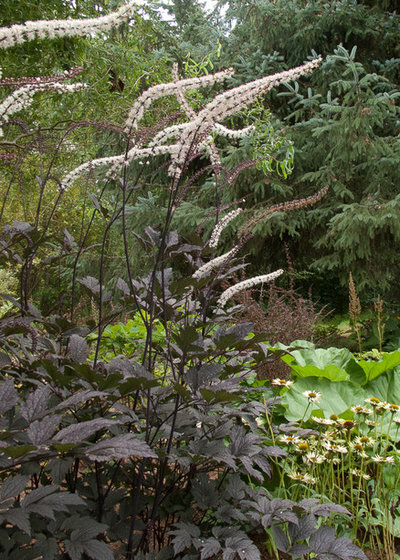 Also known as Actaea simplex ‘Brunette’, it’s a robust, shade-loving perennial with wonderful dark leaves for most of the year and, come autumn, spires of wonderful white flowers. Other good varieties include ‘James Compton’, which has more of an olive-black foliage and creamy white scented flowers, and ‘Hillside Black Beauty’, which has pink-flushed, white-scented flowers with deep-black foliage. Actaeas are long-lived, moisture-loving perennials that dislike disturbance, but will thrive once established. The leaves are great as ground cover, but can be susceptible to frosts so plant in a sheltered position. Perfect planting partners are asters such as ‘Violet Queen’ and Salvia x superba. 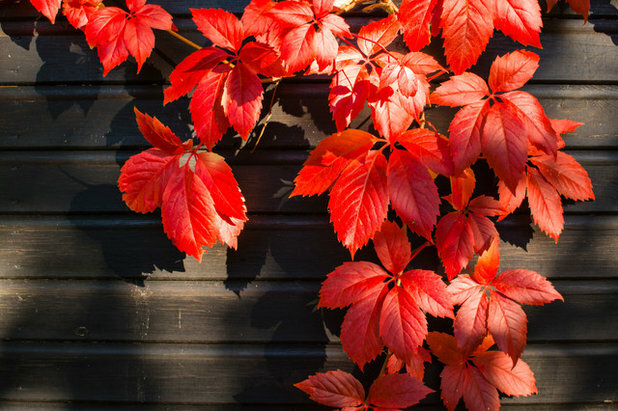 A bright creeping plant, Virginia creeper (Parthenocissus quinquefolia) is a vigorous self-clinging climber with green lobed leaves that turn the most amazing brilliant red in the autumn. 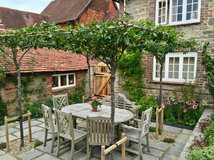 This deciduous climber, shown here, can soon cover a whole house, so can be a bit of a thug of a plant, climbing to around 15m if not kept pruned back. Virginia creeper, which, again, can be toxic to humans and animals if ingested, is related to Boston ivy (Parthenocissus tricuspidata) and you can tell the two apart by counting the lobes on the leaves. Virginia creeper has five lobed leaves as opposed to just three on Boston Ivy, which can grow to an even bigger 21m. A lovely flowering climber for the early autumn is the Clematis ‘Golden Tiara’. This late-flowering clematis is vigorous and the bright yellow-coloured flowers light up fences and walls or look just as good climbing through deciduous trees. Some of the cultivars, such as Clematis ‘Bill MacKenzie’ and ‘Lambton Park’, are vigorous. If you want a more compact one, opt for ‘Helios’, which will also cope well in a container. Plant clematis deeply in moderately fertile soil enriched with organic matter and shade the roots. 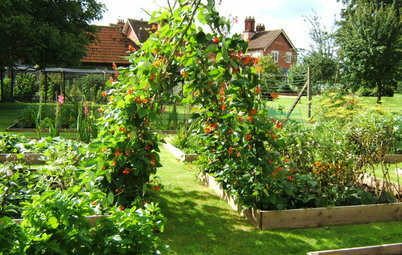 Prune to around 30cm from the ground in spring. 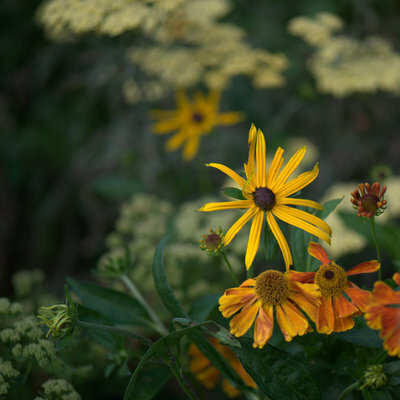 The golden-yellow, open and daisy-like flowers of Rudbeckia fulgida, or black-eyed Susan (the star-shaped, brighter-yellow flower at the back here), add a much needed splash of sunshine to the border come October, especially if planted in drifts. ‘Goldsturm’ is a vigorous, clump-forming herbaceous perennial, producing large flowers around 12cm across and is best planted in a sunny position. For more splashes of yellow, you could opt for red-hot poker ‘Bees’ Lemon’ (Kniphofia ‘Bees’ Lemon’). The flowers light up the border like torches and are a lovely shade of lemon and lime green. Make sure you incorporate lots of good drainage for kniphofias as they hate sitting in wet ground. You could also try Helenium ‘Butterpat’, which has bright-yellow daisy flowers. These plants prefer a sunny but moist soil. For damp shady areas, yellow toad lilies (Tricyrtis ohsumiensis) produce almost exotic-looking star-shaped and speckled flowers that resemble orchids. They prefer acid to neutral soils and can also be grown in a pot. All these perennials look great planted with grasses such as Stipa calamagrostis and Molinia caerulea. Producing a delicate tea fragrance, Camellia sasanqua, shown here, flowers from autumn onwards. Try an established variety such as ‘Crimson King’ with single red blooms and golden-yellow stamens or, for a similar colour but larger flowers and a more upright growth, opt for ‘Yuletide’. For a small compact variety choose ‘Tanya’. 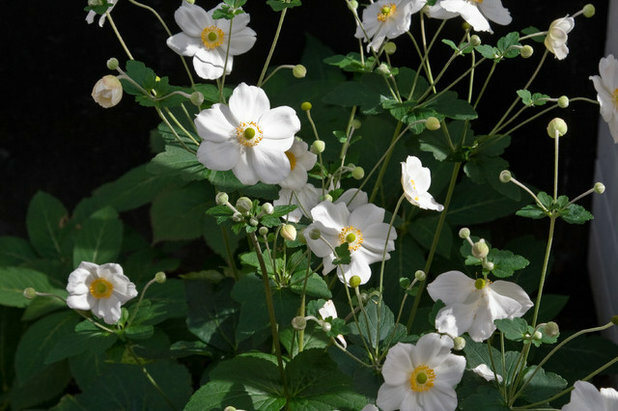 If you’re looking for a good variety to train as a wall shrub, ‘Winter’s Snowman’, aptly named for the time of year, is a lovely choice with anemone-form white flowers. 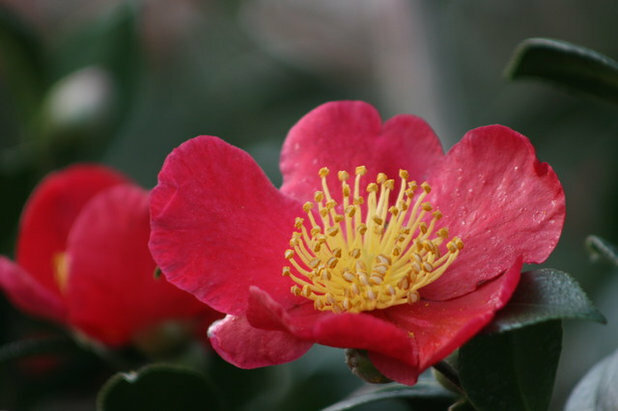 Camellias need acidic, moisture-retentive soil and the sasanqua variety prefers more sun than most others camellias. They will cope in containers if they don’t dry out and are fed regularly. If they get leggy, they can be pruned back before mid-summer. You can combine winter-flowering camellias with other early-flowering shrubs for a lovely winter border: try yellow wintersweet (Chimonanthus praecox) and the sweetly scented Lonicera x purpusii. 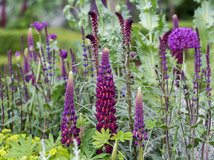 This is a bushy, upright perennial that looks wonderful in borders or pots in the early autumn. 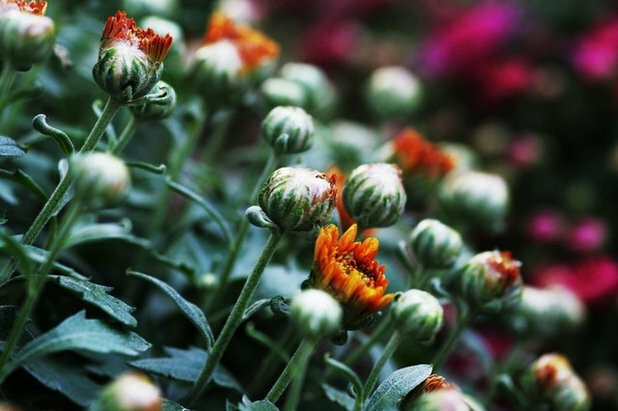 Hardy chrysanthemums make good clumps and are woody at the base of the plant. They send up stems that can reach 1m tall and the flowers, depending on variety, can be single, semi-double or double. They’re best grown in well-drained alkaline soils and planted in full sun. Chrysanthemum ‘Glowing Lynn’ (the colourful bloom in this photo) bears masses of double red to orange/bronze flowers around 45cm tall, making them ideal as cut flowers, too. If yours are potted, you can bring them indoors for winter and, if you live in a colder area, protect the crown with a thick mulch if left outdoors and cover the pot with bubble wrap. Chrysanthemum ‘Carnival Red’ bears sprays of neat double flowers and has aromatic dark-green leaves. It looks great with asters, dahlias, rudbeckias and the ‘Nantyderry Sunshine’ variety of chrysanthemum, which has bright cheery yellow double flowers right through October and November. There are so many trees that provide wonderful colour at this time of the year. Some have berries for the birds to enjoy, such as the many crab apple varieties, including Malus ‘Butterball’, for example, which has gorgeous golden fruits that glow in the light, and Malus ‘Evereste’ (seen here). 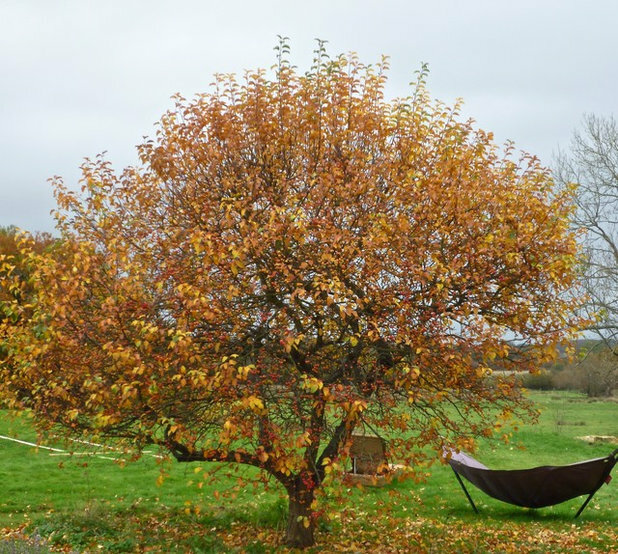 Other trees have wonderful leaf colour, such as the katsura tree (Cercidiphyllum japonicum), whose dropped leaves, some say, develop the lovely smell of candy floss or burnt sugar. The Japanese dogwood (Cornus Kousa) is another valuable tree for good autumn colour, as well as for wonderful spring interest. Japanese maples always look lovely now, but make sure you choose your maple carefully as they can get very big. If you are looking for a more compact variety, choose Acer palmatum ‘Dissectum’. It can be grown in a pot if so desired. For bark and foliage interest, opt for Acer griseum with its bronze and red leaves and beautiful paper-like peeling bark. Medlar and Quince trees look spectacular in the early autumn and, for large gardens, the acid-loving sweet gum or Liquidambar has leaves that turn a purple-red and look almost iridescent in the low autumn sunshine. In Japan, the beginning of autumn is heralded by the native miscanthus in full plumage. While ornamental grasses may not add vibrant colour, they are important features in the garden at this time of year, adding structure, movement and texture. 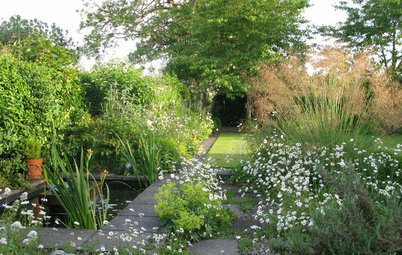 There are a bewildering number of grasses to choose from and within each variety there are also many ranges. 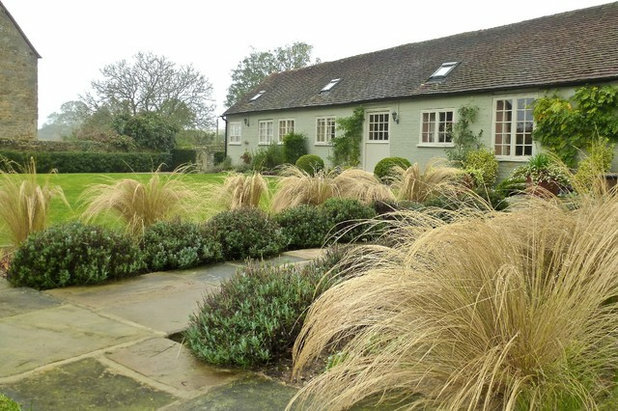 Miscanthus sinensis ‘Silberfeder’, for example, can grow so tall it can block out light if planted near a window, although at the back of a border the tall, silvery pinkish- brown flower heads look like giant fireworks. Pheasant’s tail grass (Anemanthele lessoniana or Stipa arundinacea) is a clump-forming, evergreen, fountain-like variety that turns a lovely orange, red and then yellow before turning a rust colour in autumn. Pennisetum ‘Rubrum’ has wonderful deep-red to burgundy foliage with lovely long bristly flower spikes that float in the wind and can be cut and used in flower arrangements. And pictured here is Stipa tenuissima, or Mexican feather grass. 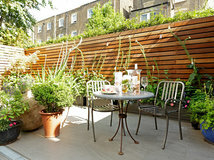 What is boosting your outdoor space this autumn? Share photos or tips in the Comments section. My garden is a bit of a mess (not for want of trying) but the 'Novae Angliae' asters I planted last year have just exploded into flower. I love them. Anemones spreading? Great - I'm off to buy some! 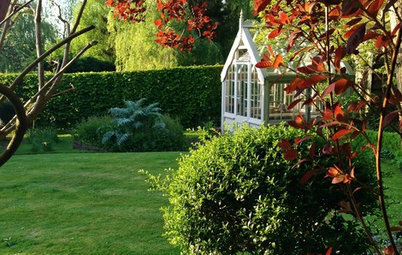 Outdoors What's the Perfect Evergreen Shrub for Your Garden? 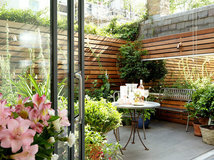 Climbing plants are perfect for brightening up bare walls and fences or hiding unsightly ones!